The instrumental case is used in the sentences like "Я пользуюсь... машиной, домом, водой" (I make use of ... a car, house, water). The nouns in the instrumental answer such questions as Кем? Чем?. By what am I admired? I admire his talent. As who does Katya work? Katya works as a doctor. The instrumental case is called so because it is used to describe the instrument by which and action is performed. For example: забивать гвоздь молотком (to drive in a nail with a hammer), писать ручкой (to write with a pen), ехать автобусом (to go by bus). The instrumental case is widely used to describe one's job - Я работаю учителем (I work as a teacher), Отец был рабочим (The father was a worker). It is also used in space and time phrases. 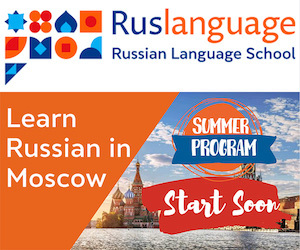 For example: ехать полем (to go through the field), проснуться утром (to wake up in the morning), вернуться летом (to come back in summer). The instrumental can also be used without prepositions. The instrumental is formed from the nominative singular nouns with the help of the following endings: -ом, -ем, -ой, -ей, -ью (singular); -ами, -ями (plural). The tables below sum up how the instrumental of nouns is formed. Add -ом to masculine nouns ending in a consonant (брат) and neuter nouns ending in -o (окно). Add -ем to masculine nouns ending in -й, -ь (чай, учитель) and neuter nouns ending in -е (море, орудие). Add -ей to feminine and masculine nouns ending in -я (тётя, дядя). Add -ой to feminine and masculine nouns ending in -a (вода, папа). 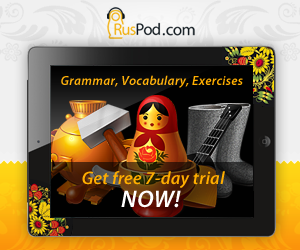 Add -ью to feminine nouns ending in -ь (ночь). Add -ами to masculine nouns ending in a consonant, neuter nouns ending in -o and -e and feminine nouns ending in -a. Add -ями to masculine nouns ending in a -ь, neuter nouns ending in -e and feminine nouns ending in -я, -ь.